Liam Kelly scored twice as Kilmarnock eased into the quarter-finals of the Scottish Cup at the expense of First Division Inverness Caledonian Thistle. Killie took the lead against the run of play after 28 minutes with a clever chip over goalkeeper Ryan Esson. Kelly fired a low drive into the far corner from 22 yards eight minutes later and then pounced on a defensive error to drive home after 59 minutes. Two superb Cammy Bell saves prevented a late Inverness consolation. It was sweet revenge for the Ayrshire side, who had lost 2-0 at Caledonian Stadium at the same stage last season. Yet the visitors came close to claiming a second-minute lead when Adam Rooney muscled his way through two defenders and was thwarted by a point-blank save from goalkeeper Cammy Bell. David Proctor tried a snap shot from 20 yards, but Bell produced a comfortable save. A snap shot from Scott Severin, who came into Kilmarnock's midfield in place of the injured Mehdi Taouil, that deflected over and a terrible effort from Sammon that squirmed well wide were all that Kilmarnock were able to muster in response. 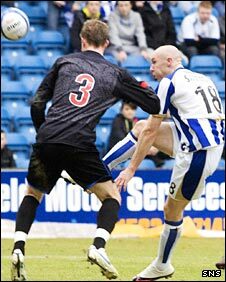 However, Kilmarnock took the lead against the run of play when Sammon, who replaced the cup-tied Chris Maguire up front, chased a long ball into the penalty box, held off his marker and chipped it over the stranded Ryan Esson. They extended the lead when Sammon crossed into the box, the ball was deflected outside the area and Kelly fired low into the far corner from 22 yards. Kelly went close to a second when he headed wide at the back post before the first half closed with Killie in control. Rooney fired a drive from the edge of the penalty box wide of the far post as the visitors looked to inspire a comeback after the break. The tie was all but settled after 59 minutes when Lionel Djebi-Zadi hesitated as he tried to decide what to do with a Garry Hay cross to the back post and Kelly stole in to slam the ball home from 10 yards. Bell beat away superbly a Foran volley from 16 yards then surpassed that by beating away a 20-yard drive from substitute Eric Odhiambo. "My personal performance I was not too happy about as I think I have played better. "But I got two goals and we got the win, so we have to be satisfied. "It has been a long time coming. "I think I spent 20 games on the bench, but I got the chance from the start last week and I feel like I have taken the chance with both hands." "We gave away three bad goals for a start and if you do that then you'll struggle to win the match. "I can't believe we didn't score, their keeper Cammy Bell has made some fantastic saves again. "It's been one of those games where things didn't go right for us at either end. Fair play to Kilmarnock, when the chances came they took them. "We'll lick our wounds and hopefully get ready for a promotion battle." 90:00+2:38 The referee blows for the end of the match. 90:00+2:06 Effort from deep inside the area by Eric Odhiambo misses to the left of the target. 90:00+0:25 Free kick awarded for a foul by Robert Eagle on David Fernandez. The free kick is swung in right-footed by James Fowler. 87:51 Daniele Invincibile delivers the ball, save by Ryan Esson. 86:31 Substitution (Inverness CT) makes a substitution, with Robert Eagle coming on for Jonathan Hayes. 86:31 Eric Odhiambo fouled by David Fernandez, the ref awards a free kick. Direct free kick taken by Ryan Esson. 84:27 Shot by Jamie Hamill from outside the box goes high over the crossbar. 83:34 Foul by Richie Foran on Daniele Invincibile, free kick awarded. Cameron Bell takes the direct free kick. 83:23 David Proctor sends in a cross. 82:43 Substitution David Fernandez on for Kevin Kyle. 81:56 Jonathan Hayes crosses the ball, Grant Munro takes a shot. Cameron Bell makes a save. 81:21 Corner taken by Jonathan Hayes from the right by-line. 81:14 Russell Duncan produces a cross, Simon Ford manages to make a clearance. 80:06 Grant Munro fouled by Craig Bryson, the ref awards a free kick. Russell Duncan takes the free kick. 79:39 Kevin Kyle is ruled offside. Ross Tokely takes the direct free kick. 78:12 Foul by Russell Duncan on Kevin Kyle, free kick awarded. Craig Bryson fires a strike on goal direct from the free kick, save by Ryan Esson. 77:48 Richie Foran concedes a free kick for a foul on Manuel Pascali. Free kick taken by Garry Hay. 77:15 Direct free kick taken by Ryan Esson. 77:15 Booking Daniele Invincibile shown a yellow card. 77:08 Daniele Invincibile concedes a free kick for a foul on Ross Tokely. 75:50 Substitution James Fowler on for Scott Severin. 75:50 Lee Cox gives away a free kick for an unfair challenge on Garry Hay. Manuel Pascali takes the direct free kick. 75:14 Free kick awarded for a foul by Jamie Hamill on Adam Rooney. Jonathan Hayes crosses the ball in from the free kick, Jamie Hamill manages to make a clearance. 74:57 Liam Kelly takes a shot. Save by Ryan Esson. 73:14 Adam Rooney takes a shot. Save by Cameron Bell. 71:18 Centre by Jonathan Hayes. 70:39 Eric Odhiambo takes a shot. Save made by Cameron Bell. 70:02 Lee Cox fouled by Daniele Invincibile, the ref awards a free kick. Free kick crossed by Jonathan Hayes. 68:27 Jonathan Hayes takes the outswinging corner, Shot by Grant Munro from deep inside the penalty area misses to the right of the goal. 68:11 Inswinging corner taken from the right by-line by Jonathan Hayes. 67:51 Richie Foran takes a shot. 67:29 Richie Foran takes a shot. Save made by Cameron Bell. 66:50 Outswinging corner taken from the left by-line by Jonathan Hayes, clearance made by Conor Sammon. 64:24 Substitution Russell Duncan on for Nauris Bulvitis. 62:07 Substitution Eric Odhiambo replaces Danni Sanchez. 61:43 Substitution (Kilmarnock) makes a substitution, with Daniele Invincibile coming on for Tim Clancy. 61:21 Jonathan Hayes produces a cross, Adam Rooney takes a shot. Save made by Cameron Bell. 60:12 Corner taken by Craig Bryson from the left by-line, Shot from inside the six-yard box by Kevin Kyle goes wide right of the target. 58:03 Garry Hay provided the assist for the goal. 58:03 GOAL - Liam Kelly:Kilmarnock 3 - 0 Inverness CT Liam Kelly gets on the score sheet with a goal from close range to the bottom left corner of the goal. Kilmarnock 3-0 Inverness CT.
56:28 Tim Clancy crosses the ball, save made by Ryan Esson. 55:47 Adam Rooney challenges Simon Ford unfairly and gives away a free kick. Cameron Bell takes the direct free kick. 54:33 Effort from the edge of the box by Adam Rooney goes wide of the left-hand upright. 52:38 Richie Foran produces a cross. 52:00 Liam Kelly crosses the ball, save made by Ryan Esson. 50:21 Foul by Ross Tokely on Conor Sammon, free kick awarded. Free kick taken by Garry Hay. 48:06 Corner taken left-footed by Jonathan Hayes from the right by-line, Simon Ford manages to make a clearance. 45:00+0:47 The ref blows to signal half-time. 45:00+0:24 Liam Kelly takes a shot. 43:19 Kevin Kyle takes a shot. Ryan Esson makes a save. 42:10 Shot comes in from Jonathan Hayes from the free kick, save by Cameron Bell. 42:10 Booking Manuel Pascali is shown a yellow card. 42:03 Free kick awarded for a foul by Manuel Pascali on Danni Sanchez. 41:19 Unfair challenge on Jonathan Hayes by Jamie Hamill results in a free kick. Nauris Bulvitis takes the direct free kick. 40:17 Conor Sammon fouled by Grant Munro, the ref awards a free kick. Garry Hay crosses the ball from the free kick left-footed from left channel. 39:47 Free kick awarded for a foul by Kevin Kyle on Nauris Bulvitis. Direct free kick taken by Ryan Esson. 38:02 Free kick crossed right-footed by Craig Bryson from left wing. 38:02 Booking Lee Cox shown a yellow card. 37:53 Lee Cox gives away a free kick for an unfair challenge on Liam Kelly. 37:19 Free kick awarded for an unfair challenge on David Proctor by Craig Bryson. Direct free kick taken by Jonathan Hayes. 35:35 GOAL - Liam Kelly:Kilmarnock 2 - 0 Inverness CT Liam Kelly fires in a goal from outside the area to the bottom left corner of the goal. Kilmarnock 2-0 Inverness CT.
34:34 Richie Foran takes a shot. Save by Cameron Bell. 33:28 Shot by Adam Rooney from outside the area goes high over the crossbar. 31:35 Shot by Manuel Pascali from deep inside the penalty area misses to the right of the target. 30:56 Inswinging corner taken by Craig Bryson from the left by-line, save by Ryan Esson. 28:00 Kevin Kyle provided the assist for the goal. 28:00 GOAL - Conor Sammon:Kilmarnock 1 - 0 Inverness CT Conor Sammon finds the back of the net with a goal from deep inside the penalty box to the top left corner of the goal. Kilmarnock 1-0 Inverness CT.
27:14 Effort on goal by Danni Sanchez from just inside the box goes harmlessly over the target. 25:28 Ross Tokely fouled by Kevin Kyle, the ref awards a free kick. Free kick taken by Ryan Esson. 24:49 Scott Severin fouled by Nauris Bulvitis, the ref awards a free kick. Direct free kick taken by Scott Severin. 23:12 Conor Sammon has an effort at goal from just inside the box that misses to the left of the goal. 22:42 Lee Cox gives away a free kick for an unfair challenge on Craig Bryson. Free kick taken by Simon Ford. 19:36 Corner taken right-footed by Craig Bryson, Manuel Pascali takes a shot. David Proctor gets a block in. 19:09 Inswinging corner taken right-footed by Craig Bryson, clearance made by Nauris Bulvitis. 18:01 Outswinging corner taken from the right by-line by Craig Bryson, Manuel Pascali produces a header from deep inside the six-yard box that clears the bar. 17:36 Cross/shot by Jamie Hamill, Lee Cox gets a block in. 16:52 Free kick awarded for a foul by Richie Foran on Scott Severin. Free kick crossed by Garry Hay. 16:11 Lionel Djebi-Zadi produces a cross, Richie Foran takes a shot. 15:24 Ross Tokely fouled by Conor Sammon, the ref awards a free kick. Ryan Esson restarts play with the free kick. 15:01 Danni Sanchez produces a right-footed shot from 35 yards and missed to the left of the net. 13:17 Liam Kelly fouled by Lionel Djebi-Zadi, the ref awards a free kick. Scott Severin delivers the ball from the free kick right-footed from right wing, save by Ryan Esson. 12:17 Danni Sanchez produces a cross, Cameron Bell makes a save. 11:20 Conor Sammon challenges Lionel Djebi-Zadi unfairly and gives away a free kick. Free kick taken by Ryan Esson. 10:59 David Proctor takes a shot. Save by Cameron Bell. 8:24 The ball is swung over by Ross Tokely, clearance made by Manuel Pascali. 7:36 Corner taken left-footed by Jonathan Hayes. 6:40 Jamie Hamill takes a shot. Save by Ryan Esson. 5:17 Adam Rooney is caught offside. Cameron Bell takes the direct free kick. 2:24 Adam Rooney takes a shot. Save by Cameron Bell.